How to recover lost contacts from iPhone 6s after iOS 9.3.1 update? How to retrieve lost contacts from iPhone due to iOS 9.3.1 update? Read here to restore iPhone lost contacts. I have iPhone 6s. Updated to 9.3.1 from 9.3 last night. Today my phone crashed, turning itself off and on, off and on, and finally got it back on, but contacts, all email accounts and calendar are gone. Apps appear to be there. Problem started when I plugged my iPhone in to computer via usb simply to charge, and got message asking did I want to be able to access photos from this computer. I replied "yes". iPhone started acting wacky while still plugged in to computer. I just backed up to computer 2 days ago and tried to restore from backup, but said backup was corrupt or not compatible with current ios. My work email connects through Office365 Outlook, which has my contacts, calendar and important emails. How can I recover lost contacts? Any suggestions? Help! Pretty a long post extracted from Apple community. To conclude, how to recover lost contacts from iPhone 6s after update to iOS 9.3.1? Every time, when there is new iOS update, accidents always happen in the process of updating like data disappeared from iPhone due to iOS update, just as the above user described. So how to retrieve iPhone lost contacts when update to iOS 9.3.1? Don't walk away. Methods are shared below. From the post above, I think the only way to restore those lost contacts from iPhone 6s is to extract contacts from corrupt iTunes backup. As you may have the question, how could that happen? Extract lost contacts from iTunes backup? Yeah, it indeed happens. We have methods here to extract and recover lost contacts from corrupt iTunes backup to iPhone directly. Here we go. In order to extract and restore lost contacts from iTunes backup, what you need is the help from iFonebox, which is the best iTunes backup extractor to extract and retrieve lost contacts from backup selectively. Plus, it is a great helper to recover deleted or lost text messages, wechat messages, whatsapp messages, etc, from iPhone or iPad directly. 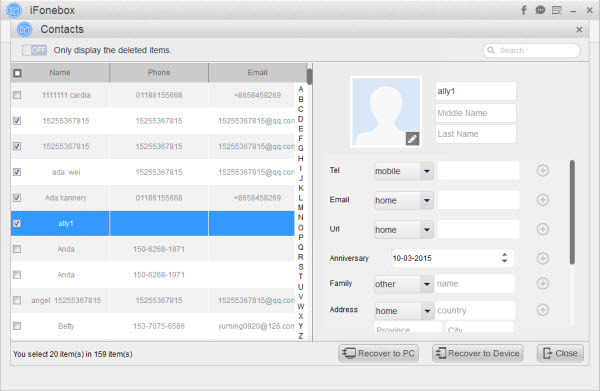 What's more, you can transfer recovered contacts back to your iPhone directly, the same as messages and note. Amazing and cool. em>Preview and select lost contacts to recover. Now you can extract those contacts and then, select them, click Recover to Device button to transfer all found contacts back to your iOS device. Notes: You can also scan your iPhone directly to get back lost contacts via iFonebox. In a word, it is quite convenient to recover lost contacts from iPhone 6s within the help from iFonebox.